in 360i News with tags 360i, Crisis, Crisis Cap, Crisis Management, Social, technology Both comments and trackbacks are closed. Social media and the dominance of social sharing have changed the landscape of crisis and brand reputation management. Now that a majority of Americans have smart phones with video cameras and Internet access in their pockets, a crisis can be spawned – and a brand reputation put in jeopardy – with the click of a button. However, according to Altimeter Group, 75 percent of brand crises could be avoided or diminished if companies had prepared properly. Our Crisis Management practice is an advanced brand reputation management offering that combines social marketing best practices with crisis preparation planning, strategy and social listening to create custom crisis preparation plans that help brands proactively mitigate risks, create efficiencies and deploy timely responses in any scenario – from social mishaps to brand attacks. 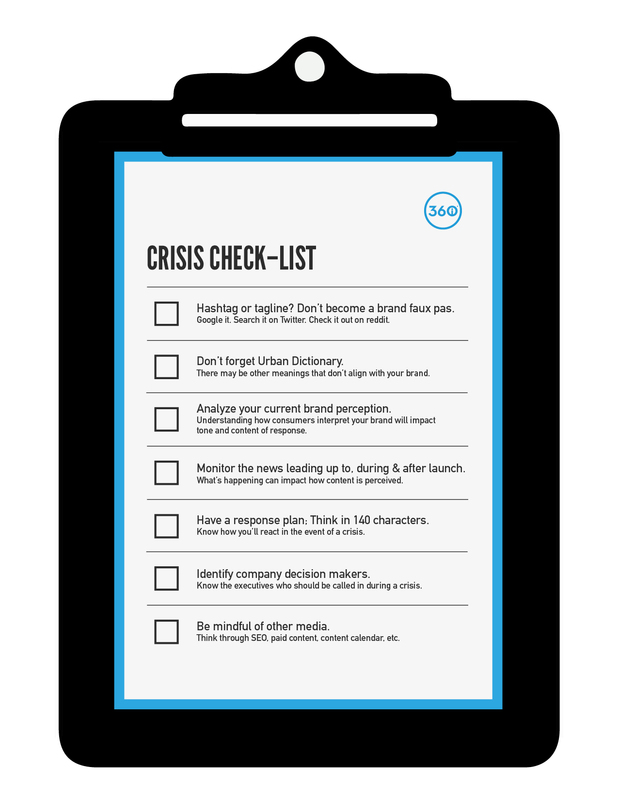 Based on a decade of leading social and influencer marketing, 360i can develop and customize comprehensive crisis management plans to proactively help marketers prepare for crisis situations before they happen, helping them know when and how to quickly address a crisis when it arises across paid, earned and owned. As part of this new offering, we are introducing Crisis CAP(SM) – a proprietary technology, based on the technology we invented to power media buying for leading brands like Red Roof Inn. The Crisis CAP can automatically monitor online brand buzz to not only serve as an alert system, but to also turn media buying and search terms on and off when crises occur. 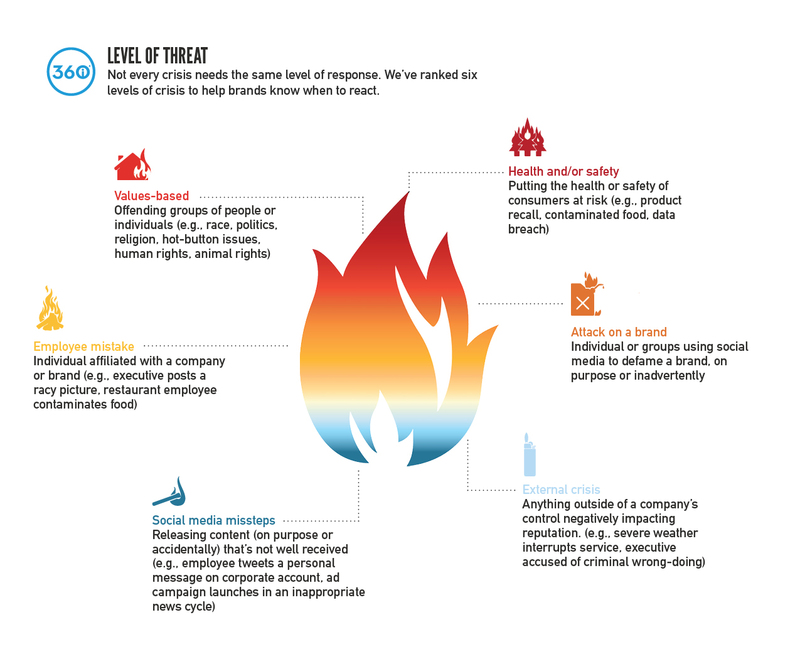 Threat Level Scorecard: We have defined six core areas of crisis to help marketers and social media mangers better understand when to elevate conversations and when to respond and react to a crisis. 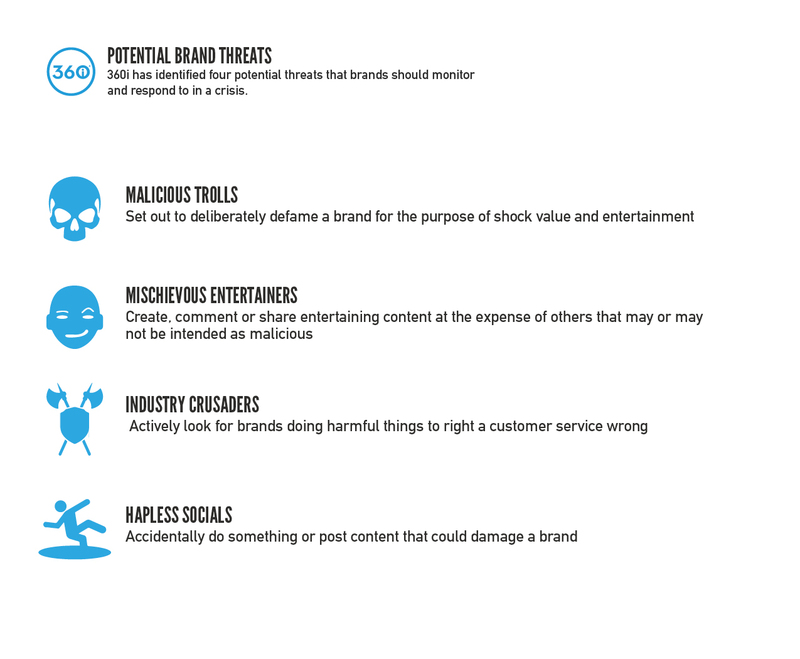 Social Channel Audit: Each of a brand’s social channels plays a role before, during and after a crisis. We will help brands establish and define roles and voices for each. Crisis Tone of Voice: We will help identify the tone of voice a brand should deploy during crisis, depending on the level of threat and the required response. Escalation & Approval Protocol: We will ensure marketers have determined roles, responsibilities and guardrails for each stakeholder and department during a potential crisis. Crisis CAP (SM) Monitoring and Response: Our proprietary Contextual Actions Platform (CAP) technology monitors thousands of data streams and APIs for unique keywords and combinations of keywords, to automatically alert brands if the wrong conversations are trending, and allows them to automatically disable SEO and SEM keyword bidding and turn off paid media to avoid brand faux pas. Read more over in Advertising Age.